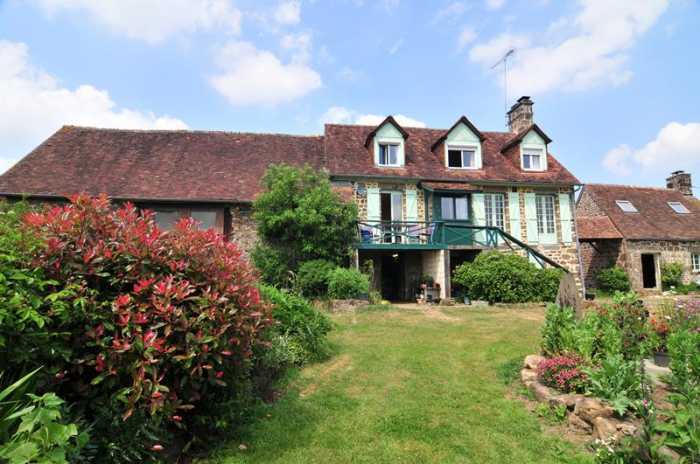 Attractive detached house and gîte with over 5 acres in Normandy. This house and gîte are situated in a quiet rural area and enjoy super views over the surrounding countryside. Ideal as a smallholding or for a couple of horses, the paddocks are already fenced. The accommodation in the main house has plenty of character with room to extend into the adjoining barn if required. The main house is predominantly double-glazed (except the lounge and shower room on the ground floor). The first floor of the gîte is also double glazed. Viewing is highly recommended. The property is found in Orne in the Normandy region of France. The closest airport is Deauville Airport (97 km). Also nearby are Rennes Airport (106 km), Dinard Airport(112 km), or Angers Airport (118 km). The UNESCO heritage site of Mont St Michel is about 70 km away. Local shopping facilities are in the village including a bakery, butchers, hairdressers, bar/tabac, post office and an infant school. There is a school bus which stops near the house and goes to Flers and Domfront. The house is in a lovely village, between Domfront and Bagnoles De L'Orne. It is located on the edge of La Foret D'Andaines. More extensive facilities can be found in the medieval town of Domfront (7 km) and in the tourist town of Bagnoles de l'Orne (12 km). It is 52 km from the department capital, Alençon. The nearest ferry port is at Caen Ouistreham which is about 1 hour's drive. Covered Porch 1.02 x 0.94m Window and partly glazed door to south elevation. Lounge/Dining Room 6.41 x 5.80m 2 pairs of small pane glazed double doors to south and window to north elevations. Wood flooring. Stairs to first floor. 2 electric radiators. Granite fireplace with raised hearth and wood-burner. Exposed beams. Kitchen 2.98 x 2.56m Range of fitted base and wall units. Space and plumbing for dishwasher. Ceramic sinks with mixer tap. Wood flooring. Space for upright fridge/freezer. Inset spotlights. Space for free standing cooker with extractor over. Glazed double doors to balcony. Shower Room 2.62 x 1.91m WC. Vanity unit. Heated electric towel rail. Shower. Window to rear elevation. Landing 2 Velux windows to rear elevation. Exposed beams. Sloping ceiling. Bedroom 1 4.56 x 2.18m Window to front elevation with roller shutter. Exposed chimney breast and stone wall. Sloping ceiling. Exposed beams. Bedroom 2 3.57 x 2.73m Window to front elevation. Convector heater. Exposed beams. Sloping ceiling. Built-in wardrobe and shelving. Bedroom 3 2.93 x 2.36m Window to front elevation. Convector heater. Recess for wardrobe. Exposed beams. Bathroom 2.86 x 1.50m Laminate flooring. Velux window to rear elevation. Sloping ceiling. Exposed beams. Vanity unit with mirror and light over. WC. Recess with shelving. Heated towel rail. 9.00 x 6.09m 2 doors to front elevation. Exposed beams. Hot water cylinder. Electrics. Space and plumbing for washing machine. Open Plan Living Room/Kitchen 4.94 x 4.86m Old bread oven. Granite fireplace with wood-burner. Door and window to front elevation. Tiled floor. Electrics. Kitchen Area with base units and shelving. Space for under counter fridge. 4 ring hob (3 gas and 1 electric). Single ceramic sink with mixer tap. Tiled worktop. Exposed beams. Stairs to first floor. Bedroom 2 Velux windows to front elevation. Sloping ceiling. Convector heater. Exposed beams. Built-in cupboards. Bathroom Velux window to rear elevation. Sloping ceiling. Electric Chauffe eau. Bath with shower over. WC. Shower. Vanity unit. Bidet. Attached to the main house is a Barn 6.90 x 6.61 + 4.27m Double wooden doors to front elevation. Small detached stone barn with tiled roof. Log Store. Woodland with stream running through. Large paddock with 2 field shelters. Large paddock with stock fencing for sheep and small paddock. Second small paddock. Well. The garden is laid to lawn with mature trees, flower and shrub borders. Pond. Vegetable garden. Gravel seating area. Variety of trees including cherry, apples, pears, nectarines and apricots. Soft fruit. Mains water, telephone and electricity are connected. Electric heating and wood-burner. Drainage is to an all water septic tank installed in 2011 and upgraded in 2017. Broadband internet connection. Please note : Whilst the Energy Report has been carried out on this property there is no Energy Rating as the Vendors do not have the Energy Bills for the last 3 years.